this one was a tough one , took me the whole mornin to think and make the background , and the other half is for the pic and effects. I found this *http://img517.imageshack.us/my.php?image=vegeta29nf.jpg* pic in the internet , and i thought "DAMN! , I HAVE TO MAKE A WALLPAPER ABOUT THIS GUY." but................... I have never colored a pic before , so i started coloring it , and i got this *http://img206.imageshack.us/my.php?image=vegeta4sp.jpg* , im still not sure if i made it right , but im not the type that gives up easily :) . In the end , i got this awesome wallpaper (I didnt know im THIS skilled XP) , hope u all like it. To tell u the truth, this the first wallpaper that I'm downloading it since 1-2 months.. Seems very different.. and i love it. 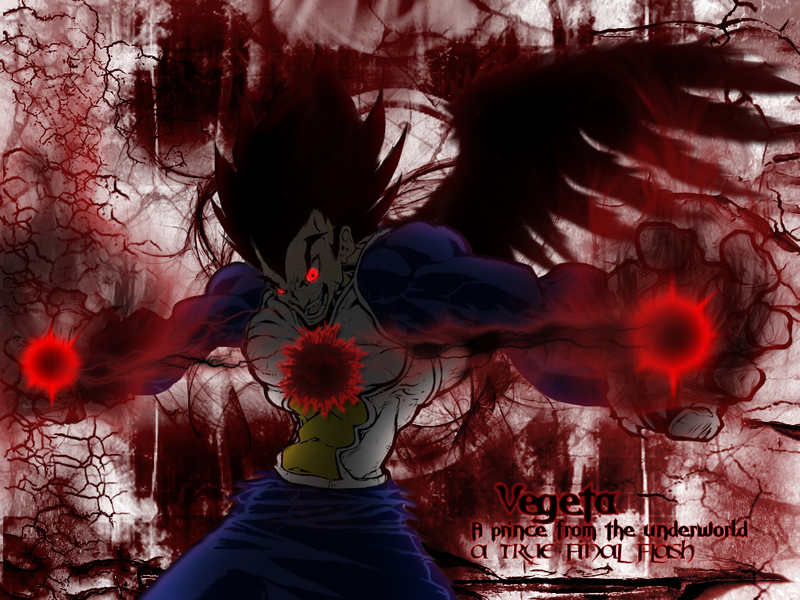 its so dark and powerful.... heh :) just like Vegeta. very nice mate... going to favs. Nice wall really nice indeed. great looking. So keep up the good work. wow he looks really cool! I haven't watched Dragon Ball Z but he looks really awsome! Awesome background ! I love the way you create it ! Look so stunning. Great work ! Dude this is wicked. Never have I seen Vegeta look so evil. The red eyes are what caught me. Then the distorted bg is just so stunning. All the effects done on here are done masturfully. Believe it. You did great Uchiha, that wing looks shweet. But I think you should've done the other side with a wing too. But heck, this looks great as is. This must be the Demonic-Final Flash! I like the backround a lot it reminds me an abandoned Church! Also the red waves are very nice illustrated ! Super work! Keep going! Hoo man, you're really good with colouring and effects..
woa vegeta final flash looks OFFICIAL! Wow! Very nice efects, you really best! you know, those wings at the back and that bloody background remind me very strongly of Abel Nightroad (when he transforms into a crusnik) from Trinity Blood.